Australia captain Rocky Elsom is supremely confident that Quade Cooper will not be distracted by mounting speculation about his future ahead of Saturday week's Tri-Nations clash with the Springboks. Cooper is currently mulling over a lucrative cross-code switch to NRL outfit the Parramatta Eels. The Australian Rugby Union are desperate to hold on to the mercurial fly-half but insist that they will not be held to ransom by the player. The tug-of-war is threatening to overshadow the Wallabies' upcoming trip to South Africa and many believe that it could have a detrimental effect on Cooper, who is set to make his return from suspension in Pretoria on Saturday week. However, Elsom insists that the 22-year-old playmaker is taking all of the attention in his stride. "He's applied himself to his work," Elsom said. "He's been fine I think but there's often a lot of things going on outside training so we expect everyone to be switched on and giving 100 percent. He's been doing that this week despite everything that's been going on." Australia head coach Robbie Deans is also in no doubt that Cooper will remain unaffected by the media furore. "He'll make those (contract) decisions when he's able," the former Crusaders boss said. "He's not the only one who has decisions to make, it's just his happens to be more public. It's not even worth wasting any time on to be honest. 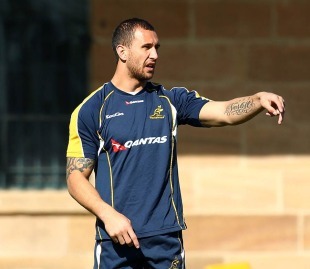 The reality is he's a Wallaby, right now, and we've got Test matches to play."